Congrats to one of our own Mister Dolly. His son, Jay, a swift footed running back, was one of the Philadelphia Eagles that upset Tom Brady and the Patriots to win this year's Super Bowl. Several things sweet me well-well for this Philadelphia win. 1) Congrats to our man Mister Dolly God don bless you well-well. 2) Another Nigerian, Nelson Agholor, was playing receiver for the winners, and made key catches. As in born in Nigeria. 3) Tom Brady na yeye man for snubbing Obama twice when invited to the White House, and being a Trump supporter. Take that Tom. That's what you get for snubbing the first black president, and being a friend of the Buffoon in Chief. Chineke does not forgive that. Once again, congrats Mister Dolly. Nna biko we are celebrating the final dethroning of the Patriots, don't bring that loser Obama into the victory parade. Glad to see 2 brothers from the shithole representing majorly!! I'm particularly happy for Jay because I feel he was unfairly treated in Miami. I'm sure it was a difficult time for the family, but he still came out on top. Congrats once again Mister Dolly! Well done MD. Our genuine congratulations to your son and your family. Well done. Dolly , get your son to cut his hair ASAP. Last edited by realtrouble on Mon Feb 05, 2018 12:13 pm, edited 1 time in total. Congratulations to Jay, his father and the entire family. Congrats Jay and Mr Dolly. Congrats Jay. Congrats Mr. Dolly. By God's grace, we will celebrate another set of Eagles wearing Green this summer. A year ago, Jay Ajayi walked out at the Super Bowl. Now he’s the fifth Briton to win the Vince Lombardi Trophy. The London-born running back played his part as the Philadelphia Eagles beat the New England Patriots 41-33 at US Bank Stadium in Minneapolis. 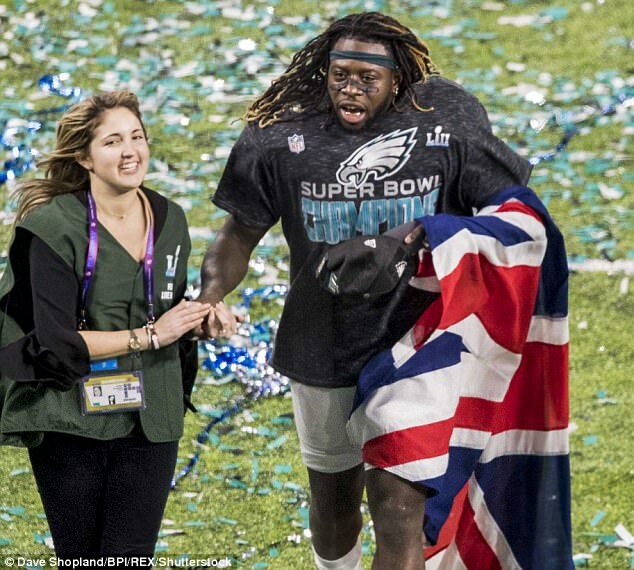 Ajayi, who rushed for 57 yards off nine carries, was draped in a Union Jack flag following the pulsating victory. ‘We’re the best team in the world, and it showed tonight. We’re Super Bowl champions,’ said the 24-year-old Arsenal fan. He paid tribute to the Ealges running backs coach and his contemporaries, who rushed for a combined 164 yards to keep the Patriots on the back foot - and Tom Brady off the field. ‘We wanted to be aggressive tonight. We understood that this is a team that does not quit we were playing, that plays four quarters and we were going to have to be aggressive all game long. Congratulations to Mr Dolly and his family. Jay kept me up watching the Super bowl. I dey work and sleep dey catch me. I no understand di yeye game but congrats to Junior Dolly!! You mean the NEW WHITE HART LANE, visit when the stadium opens? Anyway, congrats is in the right order. The Ajayi kid I have been following all season long, and Agholor too. I asked Mr Dolly he said it was Wemley?